UWaterloo Students For Palestinian Rights-UW SFPR is glad to present the First Annual Solidarity with the Palestinian People celebration Dinner. Families and friends can enjoy live performances, comedy shows and reviving the Palestinian culture within our community, and a full course meal. An Exhibition on the recent 50 day attack on Gaza from July through August. 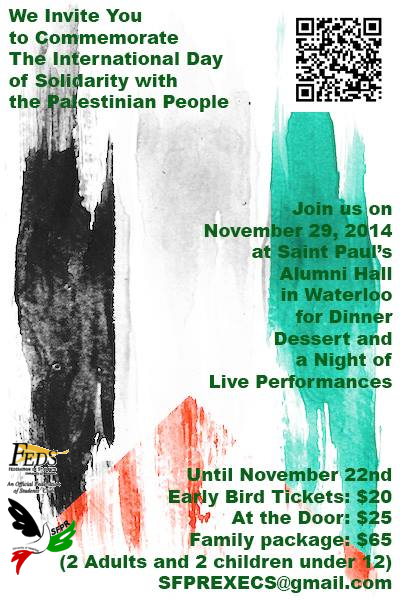 UWaterloo Students For Palestinian Rights-UW SFPR is glad to present the First Annual Solidarity with the Palestinian People celebration Dinner. Families and friends enjoy live performances, comedy shows and reviving the Palestinian culture within our community, and a full course meal. July 20 the Israeli forces bombarded the small village of Al-Shujaaya murdering 80 civilians in one day. Unfortunately the media is not giving Gaza the fair share of media coverage which needs to change. Come out Friday afternoon to stand with Gaza an expression of solidarity from the Kitchener Waterloo community with the Palestinians. Chants, Speakers and demonstrations from the members of the community. Let’s raise awareness of the issue, let’s show the community what the media is not!